Hello Kitty is not a cat, nor is she a little girl. She is in fact, a 40ish woman with a little paunch wearing a little too much make up, with a skirt that is a little too high, who is trying a little too hard to maintain her kawaii exterior, even as her caboose has started to sag. When the Internet blew up recently after it was revealed that Hello Kitty was not actually a cat, it seemed comically absurd, but also came as no surprise to me. Christine Yano, who is curating the upcoming Hello Kitty exhibit at JANM, was the source of this kerfuffle that started from an interview with The L.A. Times. The buzz shows how high interest is and no doubt the upcoming JANM exhibition will be a huge success. Kudos to Greg Kimura and everyone at JANM for bringing the kitty craze to Little Tokyo. I have always contended that I am Hello Kitty or rather, I’m among the first generation of women who grew up with Hello Kitty and because of this our relationship with the red-bowed character is special. Mickey Mouse had its origins in Depression-era Hollywood; baby boomers grew up with Charlie Brown and Snoopy. Hello Kitty was born in 1974, around the same time that I was, and her origins, like mine, are Japanese. Hello Kitty handbags at Daisy boutique in the South Bay Galleria. When I was a kid, my first exposure to Hello Kitty came courtesy of my fellow students at Long Beach Gakuen. All the girls came to class with these immaculate kaban (book bags) and shiny vinyl pencil cases, with their small compartments for pencils, stickers, pens and perfumed erasers. It all seemed exotic to a sullen kid from San Pedro with a beat-up Peechee folder and little exposure to Japanese culture. Pretty soon we were going to Gift Gate in Gardena’s Pacific Square to marvel at all the Sanrio merchandise. While Hello Kitty is the most popular character, I eventually had some Patty and Jimmy, Little Twinstars, and my favorite — My Melody, a bunny in a sporty pink hood. I don’t think I ever actually used the mini colored pencil sets, coin purses or stickers that I bought; just coveting and owning them was enough. I eventually outgrew Hello Kitty, but would check in on her every now and then. When I was an exchange student in Tokyo, we’d go to the massive Sanrio store in the Ginza district and gawk at the merchandise. The merchandise has grown up along with its clientele. 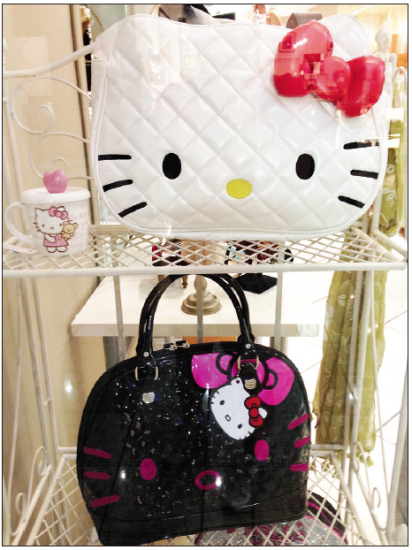 Now there are high-end Hello Kitty purses, jewelry targeting adult women, not little girls. Will Sanrio continue to market to this aging group of Hello Kitty fans? Will there be Hello Kitty or Keroppi walkers when we join the Keiro senior set? We no longer “put away childish things,” we embrace them. Even well into middle age we wear Hello Kitty, Mickey Mouse and SpongeBob T-shirts, we buy annual passes to Disneyland and collect Star Wars Lego sets. Every once in a while, Sanrio will celebrate a special anniversary for Hello Kitty and it makes me feel my age. Most recently she hit her 40th birthday. But unlike the rest of us, she is ageless and still has the same smooth complexion, wide-open eyes and expressionless face. Occasionally I like to poke fun at Hello Kitty in my cartoon. When Eric and I were dating, I imagined Hello Kitty as a “cougar,” a woman who likes to date younger men. I pattern her after another iconic diva from the ’80s — Madonna. Like Madonna, my Hello Kitty is always trying a little too hard to remain relevant and youthful. The truth of course is that Hello Kitty doesn’t have to try — she will always be relevant. If Lady Gaga has made a career of refashioning Madonna’s theatrics for the millennial set, she is also wearing Hello Kitty. A Lady Gaga dress is among the artifacts that will be on display at JANM. Hello Kitty will be forever cool, youthful and kawaii. Sadly, the first generation of Hello Kitty fans like myself will not be. Our butts will sag, our faces will age and wrinkle, we will no longer be kawaii. But we’ll still be wearing Hello Kitty.